The sheer epitome of Maurice Lacroix expertise, the watches of the Masterpiece Collection capture the urbanity, dynamism and elegance of the 21st century. As the brand's flagship, this collection is brilliantly masterful in its interpretation of complications, including the retrograde and moon indications over which Maurice Lacroix has shown such total mastery over the years. The modernist design reflects the quest for innovation encapsulated by the brand's "Never Stop Moving" advertising campaign launched last year. While the notion of movement is always at the heart of each timepiece, each design is also driven by innovation. In this collection, time is a form of expression that accepts no compromise. The acclaim of the public and connoisseurs reserved for the now famous square wheel has led the range to be extended towards a level of ultimate refinement. In 2010, Maurice Lacroix revolutionized the mechanics of time by designing a square gear wheel –a first in watchmaking history which, beyond its aesthetic value, inaugurated a new way of charting the onward march of time. In 2011, the Maurice Lacroix square wheel offered new angle on time's course with its focus on the seconds hand. This year, the Masterpiece Roue Carrée Seconde has been adorned with pink gold in order to highlight the exclusivity of its display mechanism. Who can tear their eyes away from this right-angled wheel in perpetual motion? No easy task; as the mechanism is completely captivating. 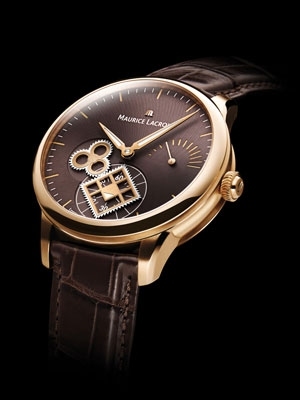 Fashioned in pink gold, like all the time markers, it is set against the backdrop of a brown-black bottom plate. The striking contrast accentuates the hypnotic effect of its angular journey and the geometrical interplay of its lines and curves. The small seconds display comes to life before our eyes with the lively and rhythmic pace of the perforated square wheel, itself driven by a second clover-shaped wheel. With corners and edges that fit together as precisely as their circular counterparts, the two gears rotate continuously to produce a highly dynamic visual effect and remind us that time never varies in its onward journey. The hours, minutes and power reserve are engraved directly on the plate of the movement and worked in gold. The 46 mm diameter steel case affords time a generous arena in which to express itself with characteristic boldness. The alternating satin and polished finishes highlight the forms. A large sapphire crystal case back reveals the mechanical ML156 movement, decorated with Grand Colimaçon in the purest Swiss watchmaking tradition. Dedicated to excellence, the new Masterpiece Roue Carrée Seconde Gold embodies the very spirit of the collection. A spirit in which engineering and aesthetics combine forces to push back the boundaries of design. Resolutely masculine and an undeniably expert piece of watchmaking, this new timepiece is highly refined while confirming the brand's expertise. It epitomizes watchmaking sophistication and affirms the total mastery of Maurice Lacroix in the arts of mechanical display beyond question. Designed by engineer watchmaker Michel Vermot in collaboration with the Haute Ecole Arc du Locle, the square wheel mechanism took years of development. By definition, the gears of the non-circular gear wheels cannot be regular. The principal challenge was therefore to determine the shape of their teeth, in order to guarantee constant power transmission. The wheels were made using LiGA technology, a revolutionary process combining the techniques of photolithography and electroforming to produce micro-components of high precision and finesse, unmatched by traditional machining methods.